Cool, I'll try to take part in this! I'll try to take part, I'm such a huge fan of your job. I don't know if I have to run for beginners or master category. 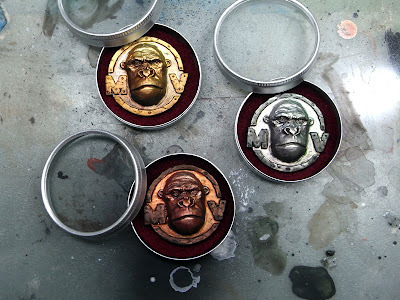 I've never gone to a golden demon or things like this (I only participated to 3 or 4 local GW contest some yeards ago and Die Vinci contest this year) so it's very difficult for me to know what is my level. I'm in... I already have a monkeylicious plan! Am in like flint here.. some great categories here, and some really nice themes. Now to think of the perfect banana diorama! Off to ponder that idea now..
"Display - You can only enter with a set of Figures, a display, at least 3 pieces. Maximum 5." It means that I must paint 3-5 figures on separated bases, or on one base? 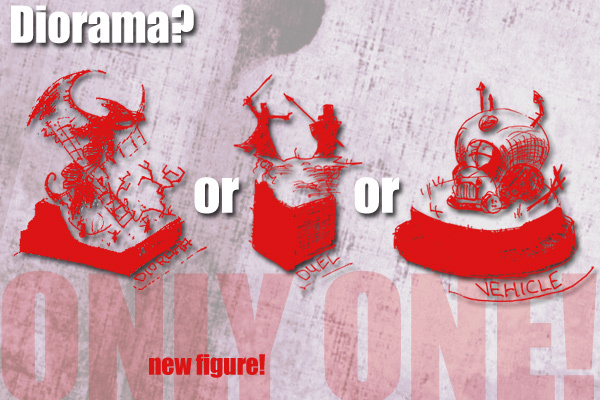 If it must be one base - what's different between DISPLAY and DIORAMA categories? "Pieces in a display can be mixed" - it's mean that I can enter with (for example) 1 Warhammer40K miniature and 2 Warhammer Fantasy miniatures? Or something else? "Display": Yes, It means that you must paint 3-5 figures on separated bases. 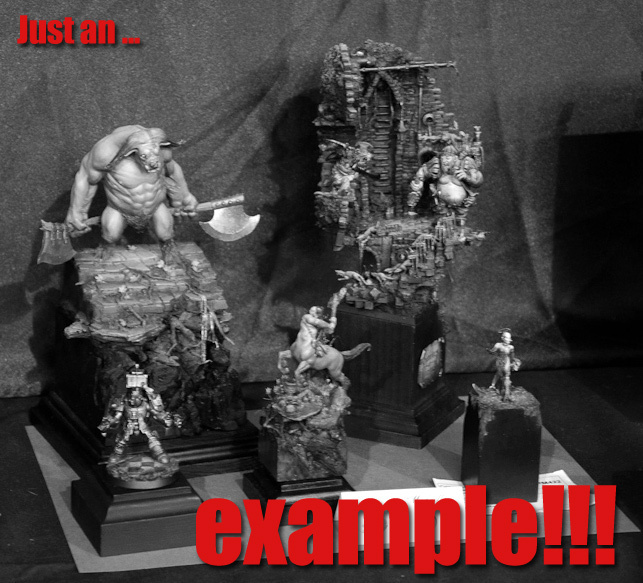 "Pieces in a display can be mixed": You can enter with (for example) 1 Warhammer40K miniature and 2 Warhammer Fantasy miniatures? Or something else from whatever manufacturer you like or prefer! Never stop asking if there are questions! Some things to clarify. The diorama category(single piece); could I submit a vignette with 2-3 figures? Is that alright? 1. Is there some rules for bases? i mean hight, diameter etc. 2. If i want to enter in contest with miniatures like, for example, GW "Imperial Guard Cadian Heavy Weapon Squad" - where two minis on one base (or something other manufacturer, but "in original" - more than one mini on base) - this is counts like 1 mini in "display" category, or 1 mini in "diorama" category? Heading home from Vienna soon! Will answer all your questions tomorrow! got a maybe rather stupid question too, the sculpting category is for unpainted models or painted ones? One question concerning the single photos for the display category.
" 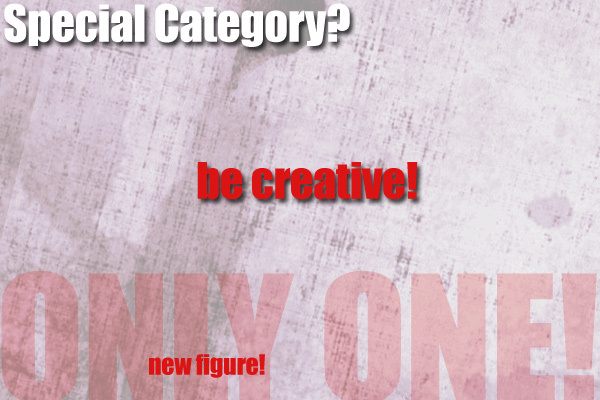 We ask you for single photos, no collages or weird cutted puzzles, just straight photos of your figures. " Can I change the background of the photo using photoshop or not? no collage but only changing the background. Do all the models have to be on their own sockets? Or can they be on normal 20/25/40 whatever bases done up? Just looking at the examples they seem to be all on sockets. Also do they have to be separated? Or for the display groups, could you do 3-5 on a single scene? Like a mini unit for example? "Can I change the background of the photo using photoshop or not? no collage but only changing the background." "Do all the models have to be on their own sockets?" Figures can be on sockets and gaming bases if you prefer. "Also do they have to be separated? Or for the display groups, could you do 3-5 on a single scene? Like a mini unit for example?" They should stand seperated. About the option where to enter units I will have a talk with Raffa and a decision in some days --- followed by an update! I´m making a diorama consisting of quite a few of my already-painted-minis + some new ones. Am I allowed to enter that in your Diorama Category even though not all of the minis are new to the world? the Diorama is new, isn't it? Hello.. Looks like a great competition. I do have one question. For the Display Category. Say i want to show 5 figures. Do all 5 have to be brand new to the world? Or could just 1 be new to the world with the rest being work that has been posted somewhere in the past? Or some other number???? no. 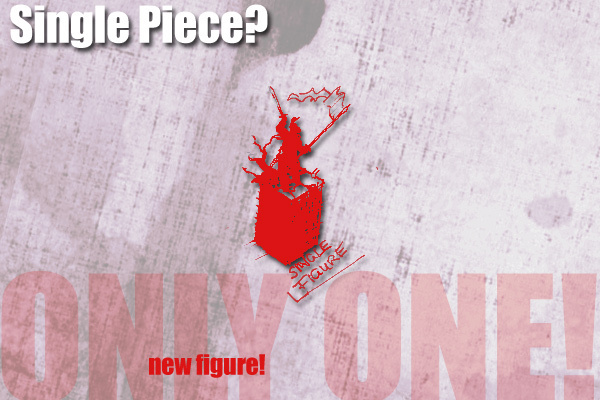 Only 1 Figure has to be a new piece in your display. 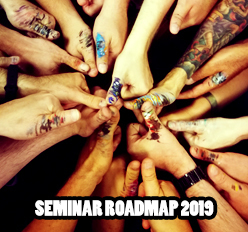 The rest can be old projects already known in the internet. I'm watching your blog for a long time. You are great and you always share usefull information. Thank for all these. And now you come with this awesome contest. I can't resist. So I would like to make two entries. But I'm not sure about one of them. Not long ago I finished my first diorama. And I presented it on some forums. But I plan to bring few improvements on it and to mount it on a base. Would it be considered new after these improvements or it be considered not new and disqualified? If the improvement and base change makes a big difference then yes, you can enter it. Thanks for your question. Yes there was a mistake in the discrbition of the categories. No Vehicles in the display categories. - no dioramas, vehicles, duels. They all go to Diorama ... or Banana! I would like to know if for the Fantasy standard, I must present five diffrente miniature, or i can present five miniature of the same Squad? 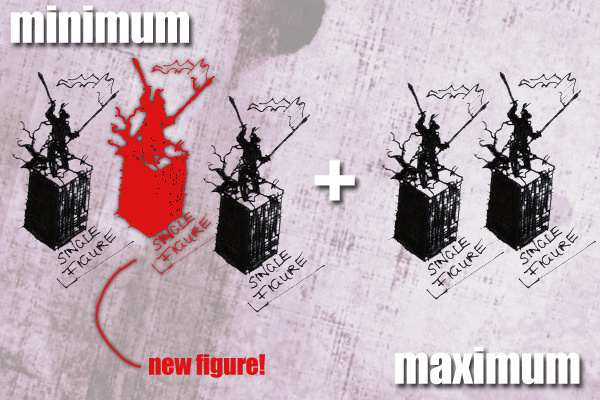 I'd say: Minimum you need 3 figures, maximum 5. You can enter 5 figures of a squad but they will be judged as single figures, not as squad.